The Lowell Brothers 43 quickly gained the deserved reputation among commercial fisherman as an excellent sea boat and was the reason this sophisticated owner chose that as the hull for his ultimate downeast styled yacht. Now an unforeseen change in plans has resulted in the decision to sell her while still new. Configured as a 2 stateroom galley up arrangement, the head with a separate stall shower and the master stateroom with an island queen berth, the workmanship and finish is all to yacht standard beginning with her varnished mahogany interior with teak and holly soles. She is beautifully detailed throughout with nicely proportioned lockers, drawers and under deck storage lockers in the cockpit. You name it, this yacht has it! All of the equipment and materials are from the best manufacturers and carefully selected for both durability and appearance. With her single 1200 HP MAN diesel and high horse power hydraulic bow and stern thrusters she will be fast, fuel efficient and a breeze to handle! The completion date is estimated for end of May with builders trials and fine tuning the first week of June. Estimated cruise speeds are in the 20+ knot range! Please review the full specifications for details and stay in touch with us for updates! Builders sea trials are scheduled for the end of May! This new custom Lowell Brothers 43, which is being finished by the highly regarded Bruce Farrin's Boat Shop is a two stateroom galley up arrangement. Even to the untrained eye, one can see that she is finished to a very high standard with a full varnished mahogany interior with varnished teak and holly soles and with the entire exterior finished in Awlgrip. Thoughtfully proportioned, her layout affords comfort and a full suite of amenities. While the headliners and lighting are not yet installed, she will have plenty of headroom with approximately 6'-8" on center-line in the salon/wheelhouse area and 6-6 1/2" outboard with almost 6'-10" headroom below. There is an abundance of natural light and ventilation with windows surrounding the salon/galley (the port and starboard windows are sliders with screens and the center windshield window is opens as well), while below there is one large Bowmar stainless steel hatch, 2 smaller ones and 6 stainless opening ports, all of these have screens. When this is insufficient to keep the owners and guests comfortable, there is 28,000 BTUs of reverse cycle air conditioning equipment fitted which will keep the yacht comfortable in a wide range of climates. Starting forward is the Master Stateroom featuring an island queen berth on center-line 6'-8" in length by 4'-6". Above the berth the hull is lined with varnished mahogany sheathing and there are storage shelves with fiddles P&S while below the berth there are 3 large storage drawers (4 drawer faces for symmetry but to port the drawer is double depth). Forward of the drawers one could store all kinds of infrequently needed items in a voluminous storage compartment accessed from the top. Aft and outboard are mirror image hanging lockers and drawers, the port side locker also houses a 30" steel safe. Continuing aft and to starboard is the Guest Stateroom with upper and lower berths 6'-10" in length, the lower being 42" in width and the upper 36". There is a large cargo drawer under the lower berth as well as a top access compartment forward. Fore and aft and inboard of the berths are hanging lockers. Opposite to port is the Enclosed Head with Vacu-flush fresh water W.C. fore and aft vanity outboard to be fitted with a Corian top, polished stainless steel sink, separate stall shower compartment with seat and storage compartment outboard and storage in three lockers at the vanity. Up three steps (storage under) to the Wheel House/Salon with helm station to starboard, companion seating to port and Salon and Galley aft. Double width helm and companion seats are P&S and have storage under. The starboard side helm station is fully equipped with all vessel controls and the soon to be fitted with electrical distribution panels. As at the port side there is a storage locker outboard. While the helm occupies the space to starboard, forward of the port bench seat is a glass and bottle cabinet. Aft and to port is the U-Shaped Settee 8' in length and 4'-5" in width. A high low pedestal table is soon to be fitted for dining and there are large drawers fore and aft for storage as well as some top load storage. The table drops down to berth height making a comfortable double berth. The Galley is to starboard and like the settee is 8' in length and L-shaped with plenty of counter space (to be Corian), Kenyon 3 burner electric ceramic cook top, large convection microwave below. Isotherm dual voltage refrigerator and top load freezer and storage is several lockers and drawers. The large center-line door does a nice job of bringing the outside in. One half step down to the Cockpit with Permateak teak sole. A large 6'-2" transom seat with storage under coupled with a 3' aft facing seat forward and to starboard (again with storage under) provide plenty of seating. (The transom seat is removable should one desire to to use the yacht for fishing.) Additional storage may be found in voluminous space below decks and in the under deck lockers P&S as well as a locker forward under the gently sloped stainless ladder leading to the flying bridge. A starboard side transom door provides easy access to the swim platform. The side decks are generous and easily accessed from the cockpit with convenient hand holds leading forward to where they are ensconced with stainless safety rails starting at the forward end of the wheelhouse. The Flying Bridge provides an abundance of seating in a U-shape (L settee to starboard and then straight settee to port of the entrance from the ladder, all of course with storage under. Yacht type helm and companion seats will be installed as well. Fully equipped at both upper and lower stations for coastal and near coastal cruising. Wired for both 12 Volt DC and 110 Volt AC service. A Northern Lights 12 KW generator handles the lighter loads while a Victron 5000 watt inverter handles lighter loads while off the dock. A Man 1200 horsepower fresh water cooled, turbo charged and after cooled diesel turns a Michigan Propeller EQY 34"X 30" #5 cup 4 bladed Nibral propeller on a 3" Aquamet stainless steel shaft through Twin Disc 1.8:1 reduction gear. To help make this a quiet running yacht the drive train incorporates an Evolution Drive System which will help minimize noise and vibration. The gentleman having the yacht built requested a design/power configuration that would achieve cruise speeds at or very near 20 knots. The company doing the finishing, based on experience with similar hulls/weights suggest that the cruise speed may be closer to 22 knots. Fiberglass hull and deck with 1" Divinycell closed cell foam coring from the engine stringers to the rail. The exterior laminates are laid up in Vinylester resin for superior blister resistance. The hull finish is Whisper Grey Awlgrip and the bottom is finished in an ablative green antifouling. Fiberglass deck and house with Offwhite Awlgrip and Whisper Grey Awlgrip with Griptex in appropriate nonskid areas on the side decks and flying bridge. The decks and house are cored with Core Cell high density closed cell foam. Exterior trim is of varnished teak including a cap rail and brow on the house finished with spar varnish. PVC rub rail with stainless cap and Alwgripped PVC spray and quarter rails. For sale only due to a change in owner plans, this stunning Lowell Brothers 43 being finished by Bruce Farrin features the best of everything throughout. She is being offered at a notable discount to her cost to build to facilitate a sale. New build projects take a good deal of owner time and commitment, regardless of builder, to approximately 2+ calendar years to complete and that is only once the hull and builder have already been decided on. Really start to finish these are more like 3 year projects. This is all done for you on this Lowell Brothers 43!! 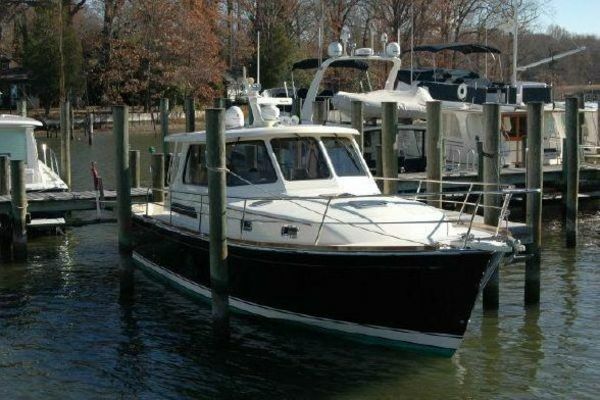 There is still time to to make a few personal touches to this incredible yacht, call now! !